MG, a British automotive company celebrates their 90th anniversary by launching a battery-powered concept car, Dynamo. The electric concept cars use the Roewe E50 platform. Dynamo was first shown at an event in London for a limited circle. 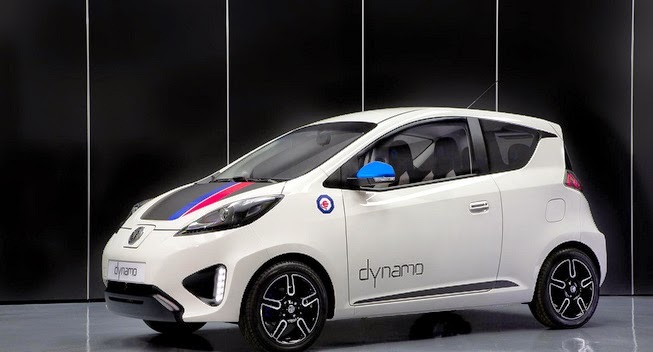 Like the E50, Dynamo uses a form of sub-compact hatchback that has a four-passenger size as the Volkswagen Up!. This car uses futuristic design that intentionally break the MG characteristic of previous and todays cars. Dynamo weighs about 1,240 kg and uses an electric motor that can put out 70 horsepower power supplied by lithium iron phosphate batteries. This car accelerates within 14 seconds to reach speeds of 100 kph (62 mph) and has a maximum speed of around 120 kph (80 mph), so this car is very suitable for use in low speed as in urban areas. Dynamo car battery pack is capable of providing power to travel about 75 km (50 miles). And the fully battery charging takes six hours in plug-in charging mode, and 30 minutes for fast charging with a capacity of 10-80 percent of the battery capacity.